Sale-a-bration More Brand New FREE Fab Items Just Added !!! Stampin' Up! have just added lots more new items to the Sale-a-bration Free Product list, these items are from the Annual Catalogue and are super lovely, we already have 15 Free Products to choose from so it's a great time to replenish your cards stock, grab yourself a couple of ink pads or just get that Stamp Set that have always wanted. It's a super time to get your hands on the items them for FREE with any £45 order. You've still got a few more days till the 31st March to bag yourself a great product but don't leave it too long as they may run out especially the Glimmer Paper as It's very pretty and super popular. I love a Stampin' Up! freebie so I've got my order all ready to go and now now is the perfect time to get them while Sale-a-bration is still on. All these items below are Free with an order of £45.. When you place your order be sure to use the item codes below as this is the corresponding number and will give you the correct item for FREE!!! I hope you can see the item codes and If you would like to make a purchase please use my Hostess Code RAHMHNZ6 and all the hostess reward get shared with everyone that has used my online site during the month, which means you will receive in the post a Stampin' Up! gift and hand made card. You know I love a nice stamp set and Stampin' Up! do such lovely ones. The Window Shopping Bundle 144743 is one I've been playing with this week and it's so so lovely. I had a super card making class on Tuesday and we made 2 cards and a gift box so the stamp set and thinlits dies were sitting waiting on my desk to be played with again. 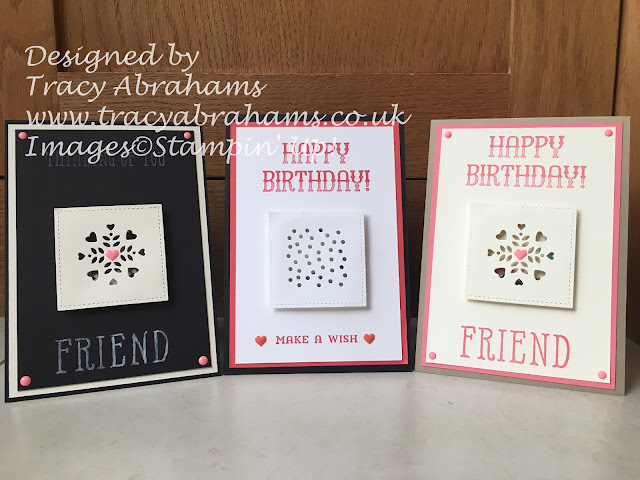 I made these super cards using the little die cuts that come along with Window Shopping Thinlits Dies gift box 144743, they are for embellishing the sides of the gift box but as you can see they make super cards on there own. There are 9 dies total and I used the heart, little spots and the candle to make these cards. The first card I made using the little die with the hearts on and I made it into a shaker cards which means I placed some window sheet 142314 behind the die cut section. I then place my super cute sprinkles Embellishments 142741 on the card and just placed the little cut out section with the hearts on, on top you have to use some of our foam adhesive strips 141825 to raise it up and then the sprinkles can move about underneath. The next card I made using the die was with the little spotty holes in it and I did the same thing and made that also into a shaker card, this time i put some sequins behind the window. The last card I made also used the little heart die but this time i made it into a thinking of you card, all the sentiments come from the great Window Shopping stamp set 142920. 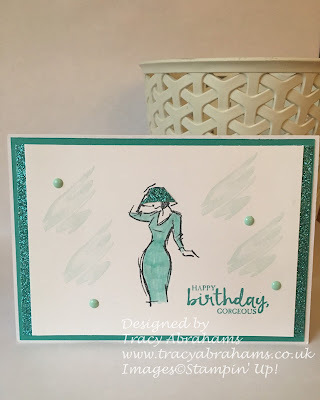 I especially love the happy birthday sentiment as it has a retro feel to it and it makes the colour on the sentiment seem graduated so the card looks super cute as you can see above. I love this card so quick and easy and it looks so cool. You can click on any of the pictures to visit my online shopping website. I would love you to take a look and see how great this set is, we have had so much fun using it this week and I'm sure I will find lots of other uses for the dies in this set. My hostess code is NJXAGANT this month and when you use it I send out a great Stampin' Up! Free gift as an extra for using my online site and a hand made card. There is still time to also grab a Sale-a-bration item with 15 to choose from (catalogue to choose the items from is on the side of this page and its clickable) also the annual and seasonal catalogues are available to look at. If you want a super offer then why not think about joining Stampin' Up! as a demonstrator under myself and get your own super Starter Kit for just £99 and this gives you £130 worth of products and during Sale-a-bration 2 Free stamp sets worth up to £93. (go to my website at www.tracyabrahams.stampinup.net or click on the side bar or any of the pictures and find the link to JOIN THE FUN then clicking the Join Now button). 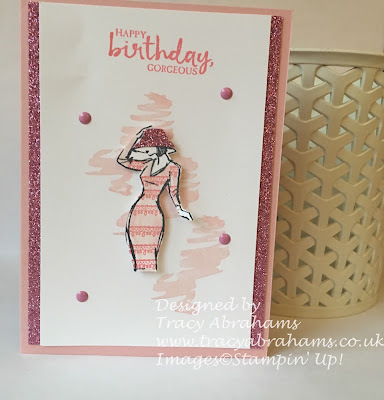 I loved using the Designer Tee 143358 Free Stamp set for these cards there are so many possibilities with all the super cute sentiments. I had to make a couple of new baby cards so I grabbed this new set and teamed it with my Baby's First Framelits dies and made these cute baby cards. There are no many babies being born at the moment that I can't keep up with all the cards that are needed !!! The Baby's First Framelits are one of my favorite dies as it makes these super cute baby grows, and they lend themselves to any cute sentiment so it was ideal. I made these cards using Blushing Bride and Soft Sky Card Stock and Blushing Bride and Marina Mist Ink. The background is made using the You've got this stamp set, and the sentiment are from the Designer Tee 143359 I think you could use these sentiments on a Tee Shirt or a jumper or just on there own. Click on any of the pictures to take a look online at the products. There are lots of lovely sentiments in the stamp set and the best bit is it's Free yes Free with any £45 order Yay !!! The Sale-a-bration offer is only on for a few more weeks so if your looking for a fabulous sentiment stamp set some of the new glimmer paper or any of the other great Sale-a-bration goodies you've got to be quick and bag them soon. hostess code NJXAGAHT when you place the order, and I will send you out some lovely Stampin' Up goodies chosen by me. All the accumulated hostess rewards are put together from all of my orders and I share them out with everyone that has purchased through my online site during the month then I divide them between everyone whether you have spent £20 or £149 and I send everyone one out a gift. You can click on any of the pictures or my side bar and It will take you to my online shop where you can make your purchase or just have a look. 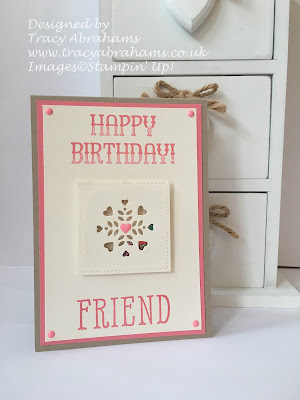 I've fallen in love, excuse the pun with the gorgeous Stampin' Up! Falling In Love Suite. It's so beautiful and makes the most adorable anniversary or wedding cards. I have quite a few anniversary's coming up and needed a bunch of them quickly. The Falling in Love Designer Series Paper is so pretty and was perfect for the cards. The Dsp comes in 12 x 12 and has 12 sheets 2 each of 6 double sided designs. I cut one sheet into 6 and used them on top of my Tip Top Taupe card stock. I then cut one of the Lace Dollies into 2 and used 1/2 on each card (they go along way like that) there are 24 in a pack for only £4, I put the doily on top of the Tip Top Taupe Mini Striped Ribbon and cut out the word love in Silver Glimmer Paper using the work from the Sunshine Wishes Thinlits. I then used one of the sentiments from the Falling For You stamp set and heat embossed it in Silver Embossing Powder, and they were all done. It sounds like they would take a long time but they really didn't and I had 6 fab cards already to send out. If you would like to make some of these great anniversary cards all the products can be found by clicking on any of the pictures above and this will take you to my online shop so you can take a look. Please use my hostess rewards code NJXAGAHT and I will send you out a lovely Free Gift and hand made card. We're still in Saleabration for a few more weeks which means extra goodies and there's 15 items to choose from. You get a Saleabration item every time you spend £45 on any Stampin' Up! product.